Shannon and Ian Rentsch have made the perfect start to their ‘King of the Desert’ title defence, setting the fastest prologue time at the Tatts Finke Desert Race in Alice Springs this morning. Rentsch completed the eight kilometre prologue track in a sizzling 4:44.4 in his Jimco Aussie Special Pro Buggy, 5.2 seconds clear of second placed Beau Robinson and Shane Hutt in the Geiser Bros Trophy Truck. Greg Gartner, also in a Geiser Bros truck, was third fastest. Rentsch, along with a number of other competitors, completed a second run of prologue when yellow flags forced them to slow their run after 2016 Australian Off Road Champion Jack Rhodes rolled his pro buggy within sight of the finish line. Rentsch had already placed himself at the top of the time sheets and went faster again on his second run, booking his place as first on the road when the 130-strong field heads off on the 226 kilometres race to Finke tomorrow. Toby Price was fourth fastest in prologue, setting up his ‘Ironman of Finke’ attempt which sees him competing in both the cars and the bikes. 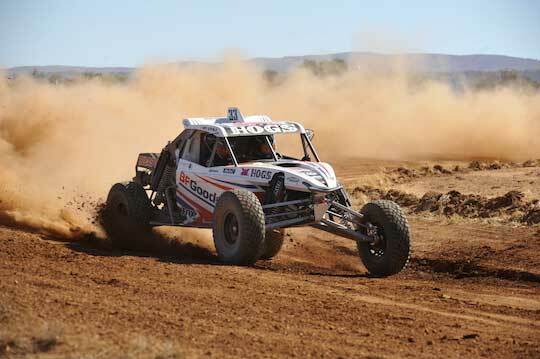 Finke first-timer Josh Howells put his Jimco Buggy in fifth after also completing a second run. Rentsch was happy with the outcome of prologue this morning but admitted to being unsettled by the circumstances. “It was pretty nerve-wracking seeing Jack rolled over and having to do it all again but lucky enough we were able to go a couple of seconds quicker in the second prologue,” Rentsch said. “We were hoping to get a win in the prologue, conditions are really dry and dusty so it’s going to be a bit of an advantage, especially for the first 30 to 40 kilometres of the track. “We have a long way ahead of us yet and we have some pretty big trucks behind us so I’m wary of that and hopefully we can get to Finke in first position. “Each year it seems to get a bit rougher in sections… in the middle it’s probably as rough as it’s ever been and up the other end it’s been graded which probably suits us (pro buggies) a bit more. The Tatts Finke Desert race, round two of the BFGoodrich CAMS Australian Off Road Championship, starts from Alice Springs at 7:45am tomorrow morning. Competitors will race the 226 kilometres to Finke, making their return on Monday, with the first car due into Alice Springs at 9:05am.